I lied when I said I’d do a news roundup last year. Got a bit busy and, near the end of the season, news and photos became sparse. Since our last post, Grady was named the Opening Day starter for the Red Sox and started out the season well then inevitably slowed down as the time off started to show. The beginning of June saw his return to Cleveland with the Sox, but sadly the reception from Cleveland fans was pretty much nil. Not long after that series he was designated for assignment, then subsequently outright released, by Boston. A week later, the Philadelphia Phillies took a chance and signed him to a minor league contract. After just a few weeks at AAA Lehigh Valley, the Phillies purchased his contract and he was back in the MLB, where he remained the rest of the season. Though his early playing time was bountiful, it soon dwindled. As the season neared its end, he was relegated to mostly PH duties due to Philly taking a look at their younger players. 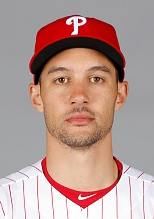 Despite this, Grady put up a respectable line of .253/.313/.389/.702 with Philadelphia in his first full season back from missing two from multiple injuries & surgeries. His full 2014 stat line (including Boston and Philly) was .233/.299/.354/.654. Most importantly, however, Grady got through the entire season unscathed in the health department. Perhaps hoping to catch lightning in a bottle, on October 23rd the Phillies announced that they had signed Grady to a 1-year $2 million MLB contract for the 2015 season. So, needless to say, 2014 was a busy one for Mr. Sizemore, and not just in the baseball world. Earlier in 2014, Grady wed his longtime girlfriend Brittany. Sorry ladies, there’s a real Mrs. Sizemore now. Congrats to the happy couple! Sorry for the lack of updates since March. I’ve tried to keep the photo gallery updated but work/vacation has made it tough for me to post all the articles & media. As soon as I get a chance I’ll do a March/April/May news roundup.